As a valuable tool for vibration analysis, the 1-117 Vibration Meter has won wide acceptance with its demonstrated accuracy, reliability, and flexibility. It has proven itself equally efficient in the field, in the laboratory, and on the production line as a monitor for use in establishing product acceptability. With four input channels, any of which may be selected at will, the 1-117 provides direct indication of average vibratory velocity and peak-to-peak displacement from self-generating velocity transducers. Optional plug-in high-pass filters or CEC’s 1- 159 Variable Filter may be used for elimination of unwanted frequencies. This is of particular value for work with gas turbine and jet or turbo-prop engines, where large-amplitude, low-frequency vibrations are apt to completely mask the low-amplitude, high-frequency vibrations of interest. 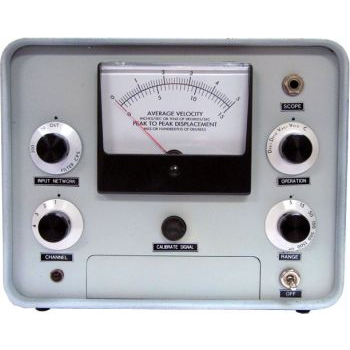 An internal calibration circuit provides for accurate amplifier gain adjustments for matching the input from a transducer of known sensitivity, to any one of four individual input channels. Individual channel sensitivity may be adjusted to provide full-scale indications from input signals as low as 27.8 millivolts. The 1-117 Portable Vibration Meter is replaced by the 1-157 Portable Vibration Meter.